The Harold and Wilma Good Library connects the campus to ideas and information in a variety of formats. In addition to over 135,000 print sources, the library maintains a video/DVD collection and serves as the gateway to thousands of scholarly databases, digital journals and electronic books. Collection strengths include peace, justice and conflict resolution, theology, early American hymnody and curriculum materials. The library also has more than 400 print periodical subscriptions and hundreds of electronic journal subscriptions. Our annual materials budget is $153,000 (for print, online, and audiovisual combined), which places us in the top one-third of private colleges and universities in Indiana in terms of resource-dollars-per-student. Librarians are available for one-on-one assistance throughout much of the day and evening and also offer group instruction. 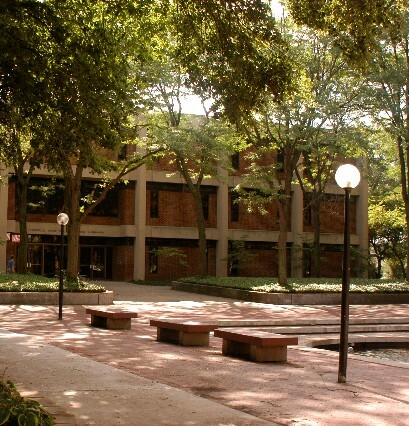 A web catalog indexes the collections of the Good Library, the Mennonite Historical Library, and 20 other Indiana college libraries. Interlibrary loans provide access to print materials in most North American libraries. Author visits, thematic programs and educational displays round out the library's many services. The building, with its three floors and lower level, was built and opened in 1967, thanks to the generosity of alums Harold and Wilma Good. Other departments housed in the building include the Academic Resource and Writing Center, the Mennonite Historical Library on the 3rd Floor, and the American Sign Language lab and lounge in the lower level. The Multimedia Production Lab in the lower level houses The Correspondent and various production video projects.